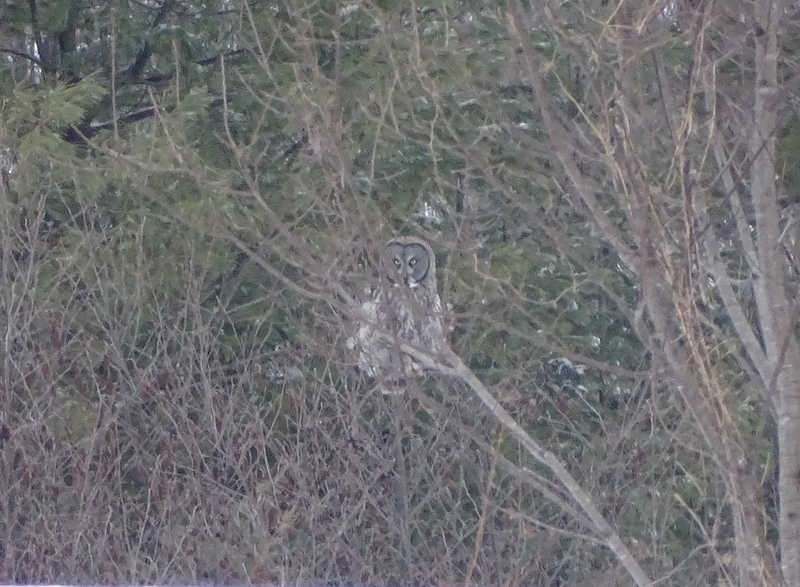 We finally saw the Barred Owl that has been calling around our cabin. Their distinctive call, “Who cooks for you. Who cooks for you all,” is unmistakable. They are a deep woods bird with unusual dark eyes; most owls have yellowish eyes. Barred Owls are hard to spot. They roost quietly during the day, and are sit-and-wait predators at night. We saw this one just before sunset, quietly watching the chickadees at our feeder. It was probably waiting for an unwary squirrel to make an appearance. They also hunt smaller mammals such as mice and voles. Their prey becomes harder to find in winter when deep snow covers the ground. Since the owl has been around we have seen fewer red squirrels – a favorite food. Unfortunately our flying squirrels have also disappeared. I think he would make a good woodcarving someday. Right now I’m working on a flying Great Horned Owl. I’ll post some photos as I carve him. In 2004 Rick was named Woodcarver of the Year by Woodcarving Illustrated. Thank you to Roger, it was an honor to be recognized by your publication. Good news! We’ll be teaching 7 woodcarving classes this year! 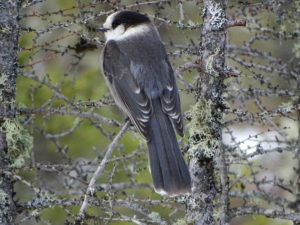 Projects include a Chickadee, Loon, Adirondack Lumberjack, and Old World St. Nicholas. Our first class will be a weekend workshop on Chickadee carving at beautiful Prospect Point Cottages in Blue Mountain Lake March 1-3. For all the details see the “Classes” page on our website. 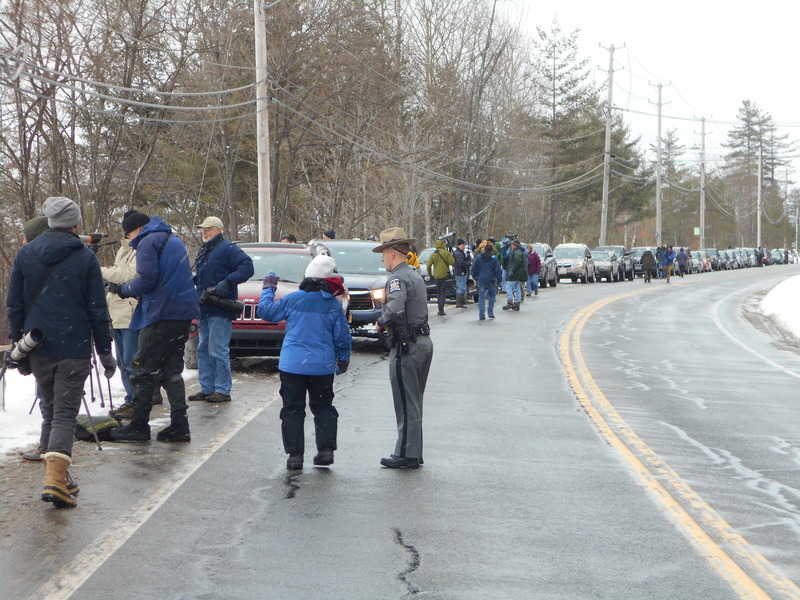 Recently Ellen and I were invited by a group called the Friends of the IBA (Important Bird Area) to look for Snowy Owls near Fort Edward, NY. This nonprofit group is working with farmers and other landowners to protect 2,000 acres of remaining grassland, which is critical for many endangered and threatened birds. 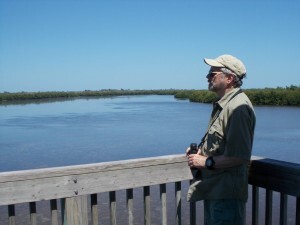 So far they have been able to preserve over 300 acres of this vital habitat. We discovered that Snowy Owls migrate from the arctic to the snow covered grasslands of the Northern US in years when food is scarce. They live on lemmings and mice and eat up to 1,600 in a single year. This is an important factor in keeping these highly reproductive rodents under control. The Snowy Owl has been highly regarded throughout history. Our Paleolithic ancestors even left painted images on cave walls in Europe over 20,000 years ago. 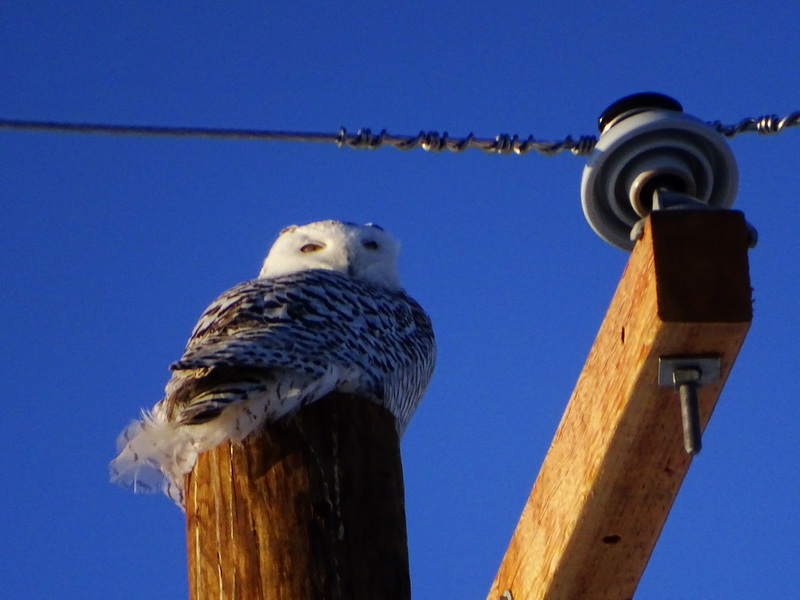 We searched for several hours and were packing up to leave when this Owl flew out of a snowy field and landed on a telephone pole over our heads. Like they say… success in birding depends on a combination of perseverance and luck. 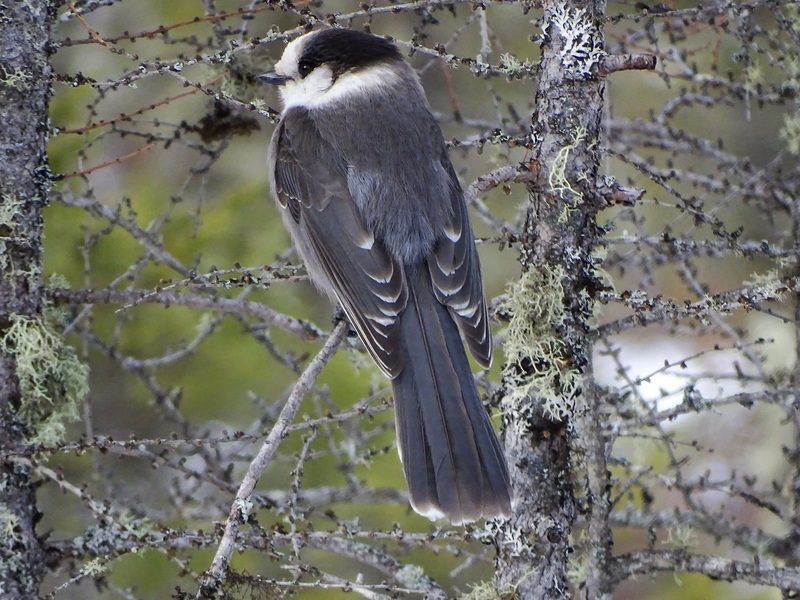 Gray Jay – Canada’s National Bird? 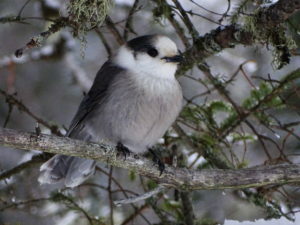 Canada still hasn’t chosen a national bird and many people are pushing to make it the Gray Jay. I agree. They are cute, hardy and friendly. 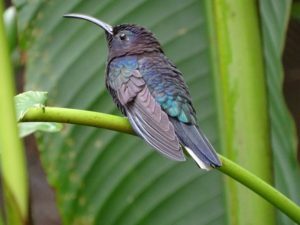 And, unlike other birds, they choose not to migrate when winter comes. Instead they brave the ice and snow; even nesting and raising chicks in spite of the freezing weather. Recently I was lucky to see several near Long Lake in the Adirondacks. The secret to their survival is to cache bits of food under the loose bark of conifer trees. They can hide as many as 1,000 little food packets a day, and astonishingly remember where each one is. This is due to a highly developed hippocampus region in their brain. This gives them an unprecedented memory. So the next time you are hiking in a northern boreal forest keep an eye open for this gregarious. hardy bird. They were right! 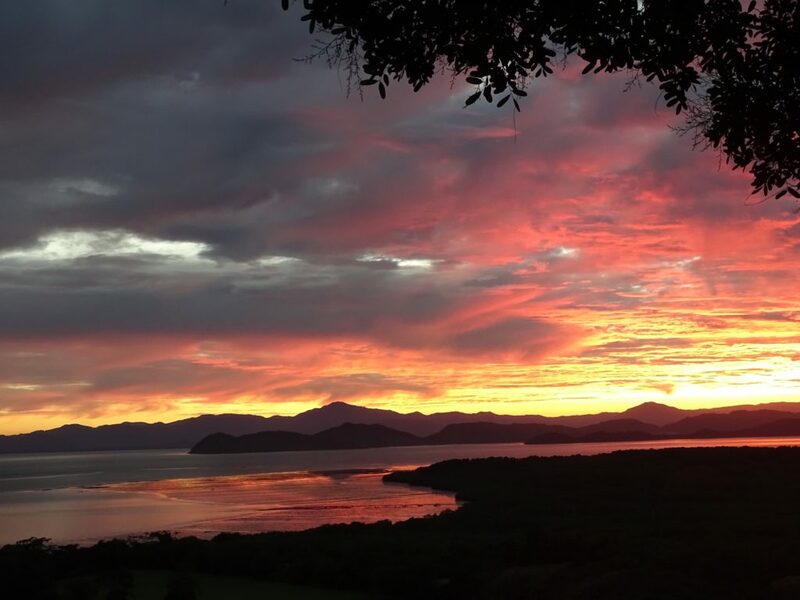 We visited rain forests, Northern wetlands, Caribbean lowlands, and tropical dry forests. We were fortunate to see 242 new birds as well as many birds that migrate from our area to winter in Costa Rica. 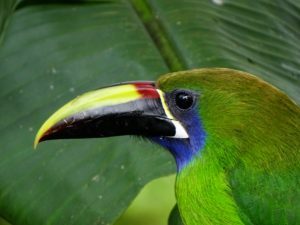 It was enlightening to see how Costa Rica has set aside so much land to preserve critical habitats for endangered wildlife. And, at the same time, provide an active livelihood for so many people in the rural countryside. The trip was exceptionally well organized and I highly recommend Road Scholar. 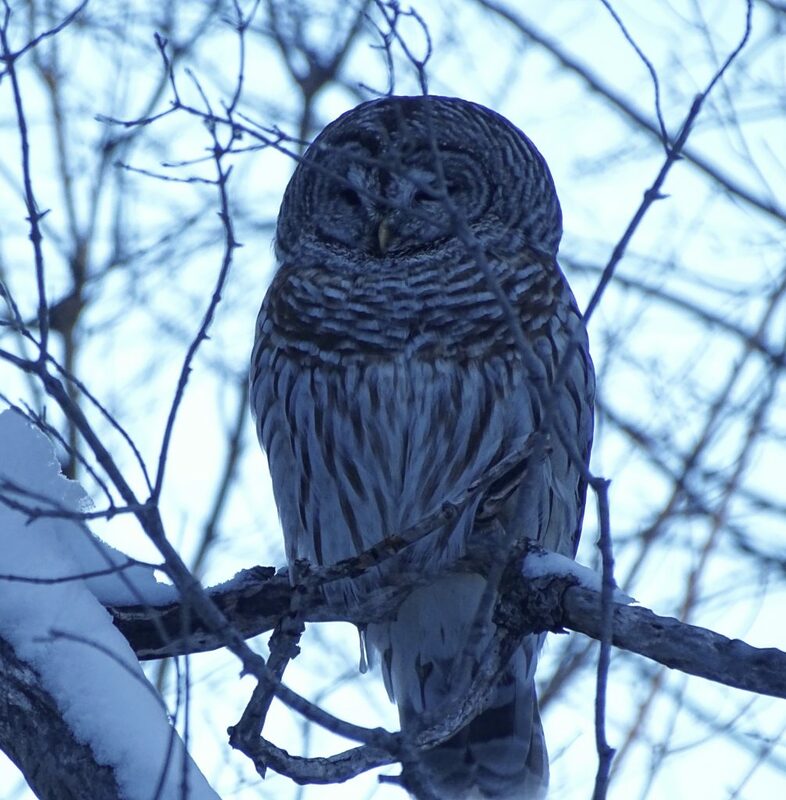 The Great Gray Owl is North America’s largest owl by height and wingspan. They are rarely seen, hence the name “Phantom”. They live in the boreal forests of North America, Scandinavia, and Northern Russia. Although rare in the Adirondacks, one was spotted in Keene. So one cold March afternoon we went searching for it. We drove about two hours to the location of the last sighting. Luck was with us. Fortunately the Great Gray hunts in open areas at the forest’s edge and we arrived just in time to see it perched a quarter of a mile away in a small tree watching for voles and field mice in the snow. 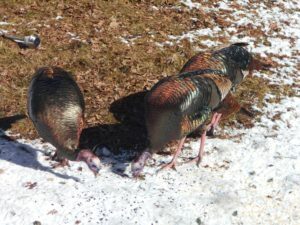 Wild Turkeys have made a spectacular comeback in the Adirondack Mountains. 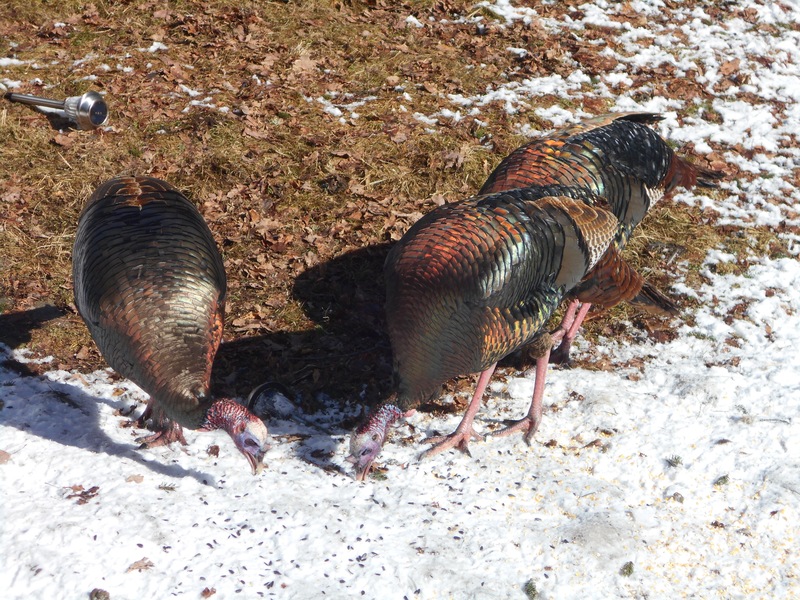 When I moved here in the mid-1970s Wild Turkeys had been hunted out of existence. Now we often see them trooping through our yard in the summer followed by a brood of fuzzy young ones. This winter a small flock of about six has discovered our bird feeders. 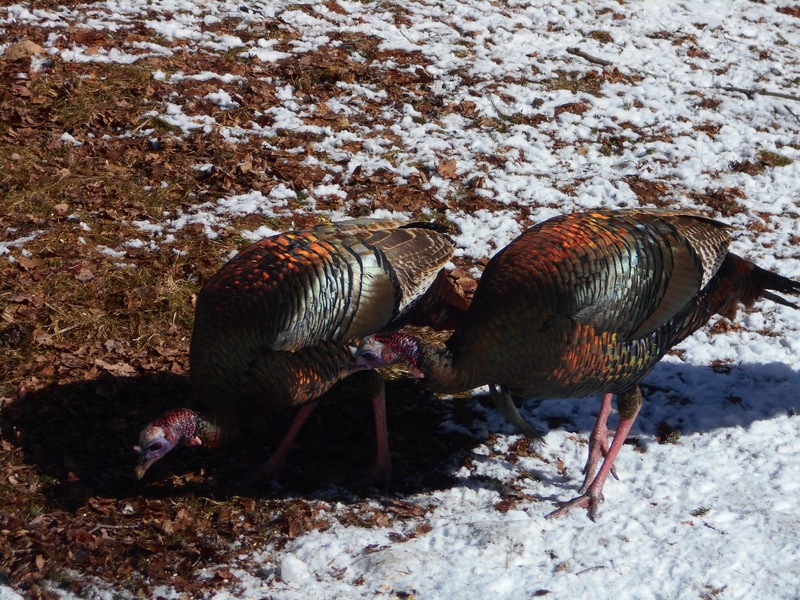 They peck and scratch in the snow looking for dropped seeds. One enterprising male was even spotted standing on a snow bank, stretching up to pick seeds out of my “Squirrel-Proof” chickadee feeder. On cold days we toss an extra cup of seed and corn on the ground for them. They’ve learned to come running when they hear the door open. Turkeys prefer to walk or run, but when threatened they can fly. The great whoosh of feathers when they take off is enough startle any would-by predators. They are ground feeders, eating seeds, nuts, tender evergreen buds, and the occasional snail, salamander, or insect. They roost in trees at night, but nest on the ground with the females providing all the care for the young. Although they look dark brown in the forest, when the sun hits them they blaze with metallic bronzes, greens, and gold. I’ve made Turkeys before and it’s a challenge to carve their fanned tails and extended wings. 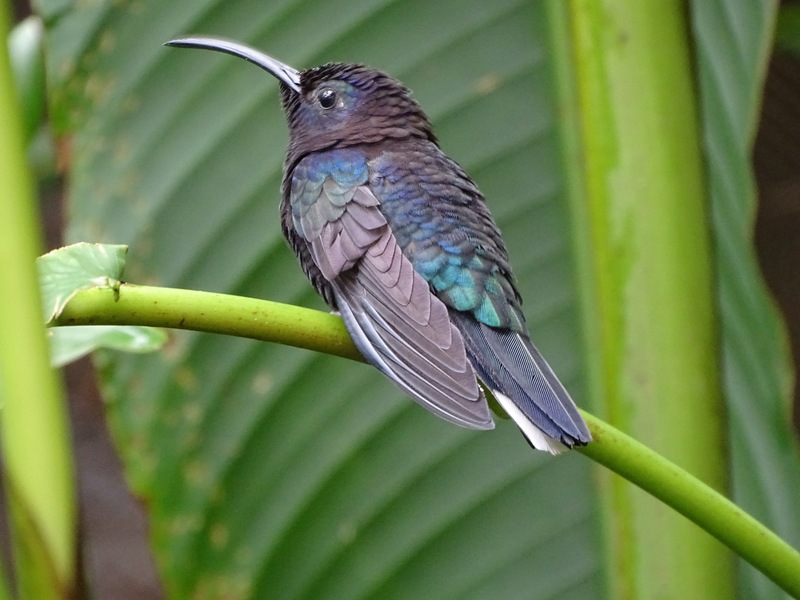 It’s especially tricky to capture the iridescence of their feathers. I’ve found brushing bronzing powders over the final nearly dry paint works the best. In the meantime, they put on a pretty good show during the long winter. This week we saw a Snow Bunting as we drove through the beautiful Keene Valley in the Eastern Adirondacks. Like the Ross’s Gull, the Snow Bunting breeds in the high arctic where it nests in rock crevices lined with fur and feathers for warmth. They winter as far south as the northern US, and are most often seen on grassy roadsides eating seeds and small insects. 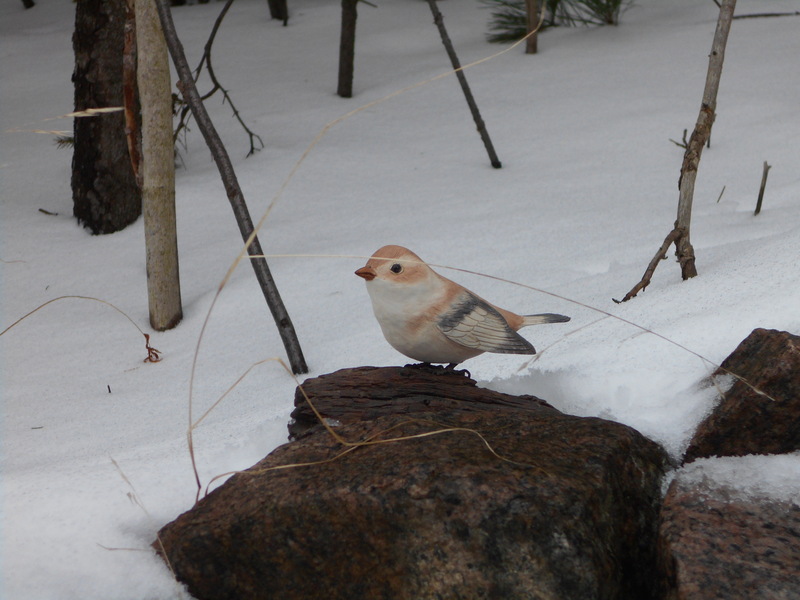 This is of a carving I did of a Snow Bunting in its subtle winter plumage. I don’t have a good photo of a Snow Bunting because we usually see them flying away as we drive. Snow Buntings in flight looks dazzlingly white earning them the nickname of Snowflakes. Their breeding plumage is completely black and white. Surprisingly they don’t molt to make the change from winter to breeding plumage. 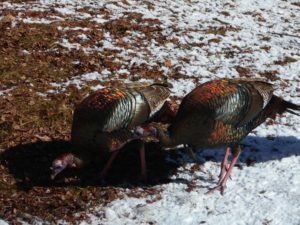 As spring approaches they rub the tips of their feathers on the snow wearing away the brown surface color to reveal the pure black and white beneath. It’s always a treat to see this little visitor from the far north. 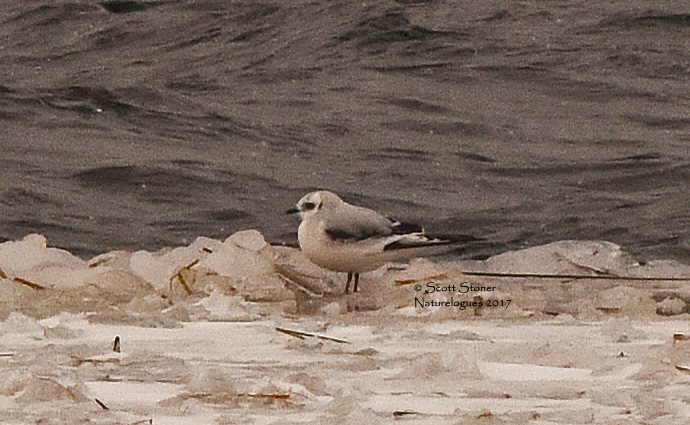 On Saturday, January 28, Joan Collins, an Adirondack bird guide, invited us to look for the rarest bird in North American, the Ross’s Gull. This diminutive gull, not much larger than a Robin, breeds in Siberia, and is a rare visitor to Arctic Canada. One had been sighted along the Raquette River in Tupper Lake. 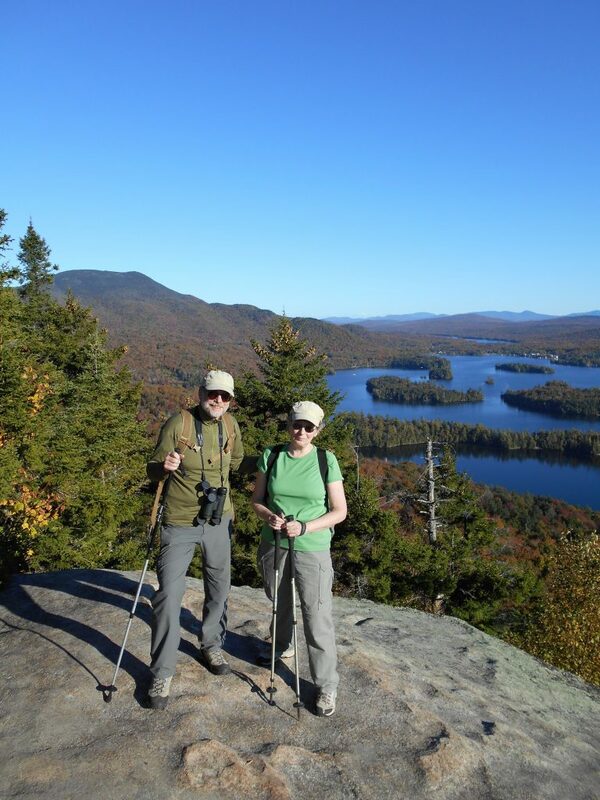 Word went out on the Internet and avid birders dropped everything to race to the remote central Adirondacks. We searched for a couple hours without success then decided to enjoy some of the other birds in the area such as the Barred Owl and the Gray Jay. As we drove south along the river a woman in our group caught a brief glimpse of a white bird landing on the ice next to a stretch of open water. There it was! a small pale gull, 200 yards away. Soon over a hundred people arrived armed with huge telephoto lenses and spotting scopes. Many had traveled here from as far away as Georgia with the hope of sighting this bird. Two State Troopers showed up to see what the trouble was, and were astonished to find a bird was causing the traffic jam. After hearing Joan’s explanation they stopped trying to break up the group, and helped organize our cars on the shoulder of the road. It was my first experience with the world of extreme birders. Even though I was delighted to see such a rare bird I have to confess walking quietly in the woods is more my style. Thank you to Joan for an exciting day of birding and to Scott Stoner Naturelogues for sharing a photo my small lens couldn’t capture. © 2015 Rick Bütz Woodcarving. Web design by Advokate.